For over a year, she has been interested in letters, writing, and the sounds of letters, but has resisted actual attempts to help her learn to read. She took the approach that it was fine for her to ask as many questions as she liked, and it was fine to help her do pages in workbooks, but she didn't want to hear anything from us when it came to showing her how sounds went together to make words. She would write actual letters to people and to fairies, painstakingly asking how to spell each word and writing the letters carefully (sometimes backwards, sometimes circling the page if she ran out of room, sometimes vertically-- but if you looked the letters were in order) and because she has been read to since infancy, she has many, many books memorized--so she would sit and recite books verbatim. She just didn't want to go through any actual organized process called "learning to read." I kept thinking she would read any minute, because she was so good at all this other stuff, but she didn't. Then last week, during yet another interminably rainy afternoon, we were snuggling on the bed in my room, just idly talking and playing around. She asked me to play a spelling game with her, and so I started spelling some 3 letter words--pat, dog, ran, red, set, etc.--and to my shock, she knew what almost every one was! She was also excellent at telling me other words: when she told me what P-A-T was, I then asked her how to spell cat, mat, hat, fat, etc. and she did that easily. I said to her, "Wow, Emma! You are so good at this, I bet you'll be reading soon!" Her response was: "Well, technically, Mama, I can already read--I know what noises all the letters make!" After I stopped laughing, I pulled out one of her favorites, "Bing Bunny". She read it to me. This wasn't too surprising, because as I said, she knows a lot of books by heart. So I made her a story on paper with simple sentences and my version of illustrations....we'll skip those! But the story was something like, "The hen had a hat. The hat had a bow. The pig liked the hat. The pig got a hat, too." She read it pretty well, just a couple of mistakes. So the next day we went to the library and picked out some of those dreadful easy readers--and by the way, do people get paid to write this garbage? And is it any wonder that most kids think reading is boring?? ?--guaranteed material she doesn't know word for word. And she read those, too, with some sounding out and some mistakes. Yay! She still isn't at the point where she'll allow me to trot her accomplishment out to people. She gets shy when I tell people she can read and will clam up. 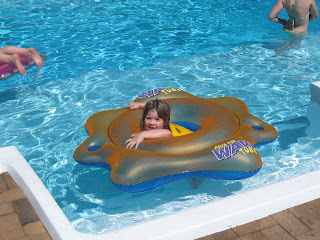 But she is on her way--and anyone who knows Emma knows she won't stay shy for long!! 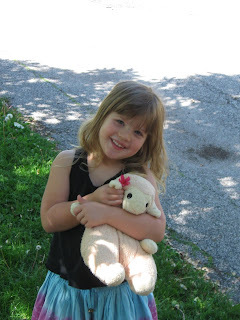 Yesterday we went to Wickham's Farm in Cutchogue with a group of homeschooling friends for strawberry picking. We missed out last year--the time slipped by and before we knew it the berry season was over--and were determined to go this year, so when I saw the group trip I lost no time signing up. We've picked peaches and apples at Wickham's before, but we'd never had the farm tour. We got a great long hay ride all around the farm and our guide pointed out all the crops and told fun stories about the farm, which has been continuously farmed by the Wickham family since before the Revolutionary War! We saw peaches, apples, pears, plums, cherries, apricots, nectarines, raspberries, blueberries, blackberries....and I may have forgotten some! I was amazed to learn that they actually get rid of their trees after some time; the trees have a certain shelf life where they bear the best fruit. Maybe it's because I am such a subpar gardener, but I can't imagine ripping these beautiful trees up and throwing them on a scrap heap, then starting all over from seedlings! However, it goes without saying that they know what they're doing, and I don't! The day started off threatening and overcast; the trip was nearly rescheduled. But in the end we went, thankfully--because the sun came out and it was gorgeous. Not too hot, light breeze, no bugs. After the hay ride, we learned about the bees the farm keeps and we picked our luscious fruit, then picnicked and played with our friends in an open field with a convenient picnic pavillion. I stopped in to the farm stand and bought honey (from their bees, naturally) and two dozen homemade donuts......talk about delicious. I am thinking of trying to make them here! We each got a big quart box to pick, so we ended up with two gigantic bowls of berries. We used half for our traditional strawberry shortcake dinner, and now have enough berries to last us at least two days around here! 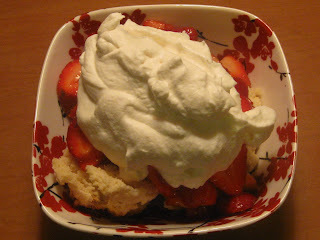 My mom always had a day where we had shortcake for dinner--and this is the real deal--no crummy sponge cake or canned whipped cream, but homemade butter biscuits topped with sliced strawberries juicy with sugar and fresh whipped cream with pure vanilla added in. To die for, simply put. The kids look forward to it--but nobody can ever eat all they take! It's that rich. 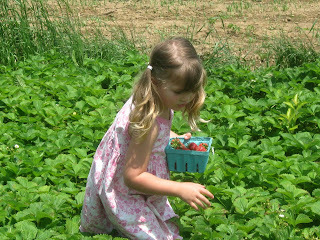 I'm always kind of sad after we go strawberry picking--it's the first milestone of summer to me other than swimming. However, after looking at the Wickham picking schedule, we may be picking quite a lot of fruit this summer! Enough With This Weather, Already! I am not going into a diatribe here--but come on, we have had the rainiest spring EVER here on Long Island. This weather is just plain inappropriate, and it is ruining our good time. I expect better of the months of May and June. They are generally two of the most gorgeous months we have...though, actually, Long Islanders experience nice weather most of the year. Still, I am pouting. We are almost finished with the school year, and have not been able to enjoy enough time in the yard, on the patio, or on the beach for my liking! We were supposed to head into the city tomorrow for a day at Victorian Gardens (tiny amusement park) and bumming around....rain date. We went to the Long Island Game Farm on Tuesday and endured standing in a downpour for about a half an hour--though thankfully, that blew over and we enjoyed the rest of the day. 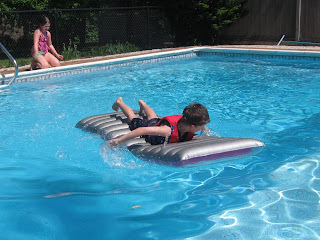 Our staycation last week had unexpected weather interruptions that didn't make me happy. Enough already!! However, I will say that it hasn't been completely miserable. We have had days since April that have been positively summer-esque, and those have been real treats. They just haven't been as numerous as they usually are. 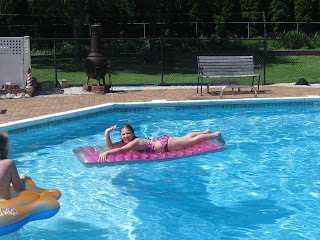 I'll leave you with photos of the kids in our neighbors' pool...despite the rain, we have been swimming several times. And our lovely neighbors Linda and Dennis are away in Maine again till the end of June, so we have the run of their flower garden and strawberry patch, too!